O bliss of the collector, bliss of the man of leisure! 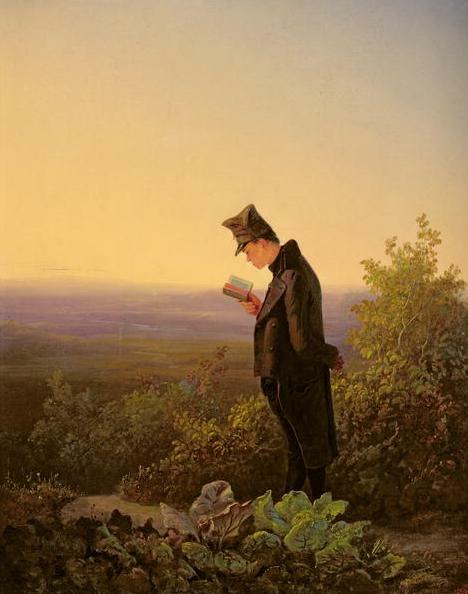 Of no one has less been expected, and no one has had a greater sense of well-being than the man who has been able to carry on his disreputable existence in the mask of Spitzweg's "Bookworm." For inside him there are spirits, or at least little genii, which have seen to it that for a collector - and I mean a real collector, a collector as he ought to be - ownership is the most intimate relationship that one can have to objects. Not that they come alive in him; it is he who lives in them. So I have erected one of his dwellings, with books as the building stones, before you, and now he is going to disappear inside, as is only fitting. Even the dream of a "better humanity" in which our children would "have a better life" is only a sentimental fantasy reminiscent of Spitzweg when it is not, at bottom, a dream of a better nature in which they would live. It's almost impossible to describe how much I like everything about this, even Benjamin's small remonstrance at the bottom, which I suppose is correct, although it makes me think of my daughter when she adopts a certain facial expression and says to me "all right then, BE that way." Books, genii and ravens. This is just lovely. Yes, "back to books" -- my visitor this morning was the red-tailed hawk, and those cormorants. . . .
"Sometimes all it takes is one voice." could perhaps be "read" as a "page"...? All of those -- I love The Visit -- but what about The Poor Poet with his umbrella? 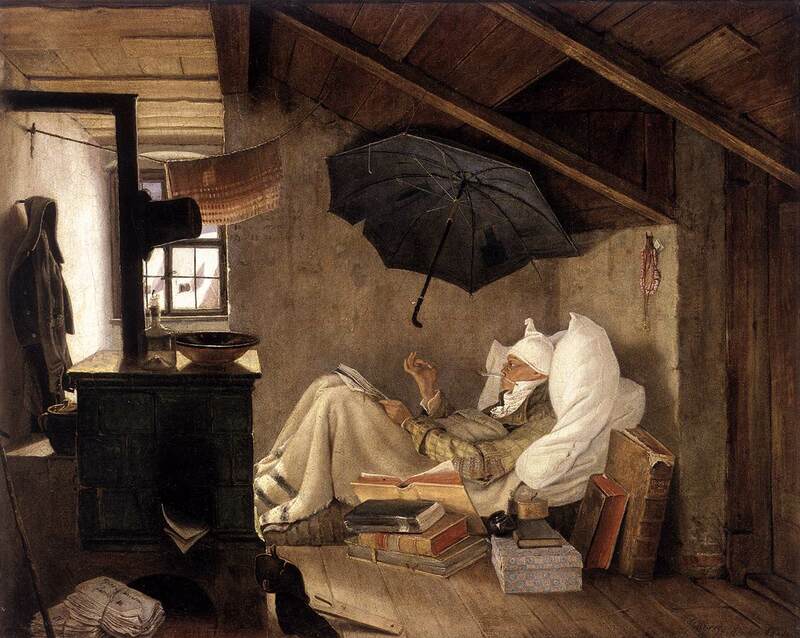 Oh well, at least some sunlight seems to be coming into his room, unlike some other poets we could mention, but why the inflated umbrella over his bed? What about drips? The books and the stepladder remind me of Dr Syntax & the bookseller. I love the similar gestures of the readers. The umbrella must be protecting the poor poet from a "gotera" (let me look in the dictionary... a leak ¡eso!) a leak in (?) the ceiling. He lacks, among other things, of a good architect like you, Artur. this artist is "self" taught .... I betcha! Just now, revisiting the images, I discovered the obvious idea: the readers are always alone, love is their forbidden path. Or if it's not love at least they don't have any female company, like the no-readers. Yes, I like the similar gestures of the readers too, Julia. Except in the room of the poor poet, the viewer is always looking upwards at the reader (and that makes me guess he wasn't self-taught). Ah, that man on the ladder looking at his books, that man at his desk looking up at the visitor. I spent my yesterday going up the ladder, patching leak in roof (otherwise the books would sit under the umbrella). My visitor today is a gull flapping toward ridge. . . .
"The readers are always alone, love is their forbidden path. Or if it's not love at least they don't have any female company..."
According to the catalogue of the Neue Pinakotek, Munich, Spitzweg was, indeed, self-taught... and evidently a bit sensitive on that point. "Carl Spitzweg came from well to do middle class circumstances and originally worked as a pharmacist. Only after suffering a serious illness did he decide to follow his real calling and dedicate himself entirely to painting. Thanks to his established position in society and an inheritance, he was able to practice his art with no financial worries. Nevertheless the loner Spitzweg, who was self-taught, insisted on acknowledgement as a professional artist. This, however, came only in 1868 when he was named honorary member of the Munich Art Academy. During his lifetime Spitzweg sold upwards of 400 paintings. His admirers and buyers came especially from the new buying power of the positioned middle class, even though the real popularity that he enjoys today came only after the second World War." Artur, it's wonderful to think about the grand Abyss of Connection between Spitzweg's Bookworm and my pedantic, ridiculous, accident-prone doppelgänger, Doctor Syntax. Those paintings are real good. Total fun to read each of these comments. Your last comment satisfies all my inquisitions over the last two nights regarding books and the two paintings- The Forbidden Path, c. 1840 (Sammlung Georg Schäfer, Schweinfurt) and The Bachelor, n.d. (Museum der Bildenden Künste, Leipzig). Some times you don't need to ask for it. Like the bus just stopped over for nothing but you very coincidentally had to take a piss. Thank you conductor should i say. De nada, says the conductor.